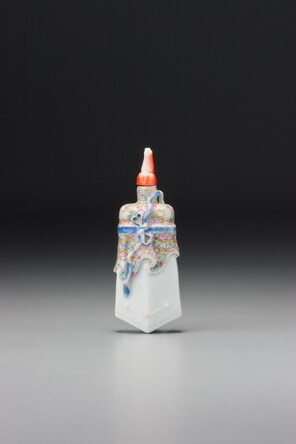 This extraordinary and very rare moulded porcelain bottle does not fit into any pattern of repeat production, making it difficult to date precisely, although a Jiaqing date is likely. It is unusually thinly potted, though made in the standard form from a two-part mould, with the two parts joined vertically; the interior is left unglazed, which is perhaps a hint that it may not postdate the end of the Jiaqing reign. In terms of rarity, delicacy, and sheer quality, this comes close to being a mid-Qing equivalent of the Tang Ying bottles from the early Qianlong era, standing head and shoulders above the standard range. The gui is a ritual object that originated as far back as the Xia and Shang periods (ca. 2100–1050 BCE) and became widely used during the Zhou dynasty (ca. 1046–256 BCE). Various kinds of gui were made for different purposes. For examples, while some were used as an insignia to denote the status of the nobility, others served as a text carrier during sacrificial ceremonies honouring heaven and earth, the four quarters, ancestors, spirits, and allegiance between the feudal lords, and still others functioned as a token of faith or authority on various occasions, including the confirmation of a marriage, a proposal, or an employment, guaranteeing punishment, and serving as grave goods together with others to safeguard the deceased. In symbolic art, the gui denotes a desire for distinguished official appointment and accompanying wealth. Here, this wish is augmented by the addition of three stars – a simplified representation of the three Star Gods (the gods of good fortune, wealth, and longevity) – and the brocade wrapper (jinfu) that serves as a visual pun for gold (jin) and happiness or good fortune (fu). The longevity wish is further reinforced by the blue ribbon, on account of its long shape. Finally, the rather ruyi-like formalization of the lingzhi on the brocade cloth suggests wish fulfilment. 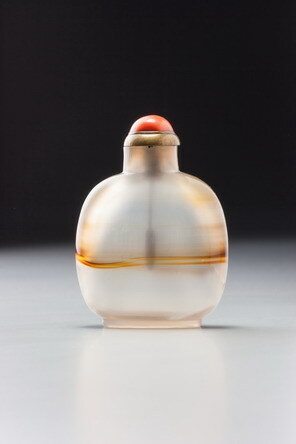 The gift of such a bottle might imply that the recipient is likely to rise to high rank, be long lived, and have whatever else he might wish – and into the bargain he gets a splendid, refined, and very elegant little snuff bottle.